OBJECTIVE - To implement and evaluate a regional prepregnancy care program in women with type 1 and type 2 diabetes. RESEARCH DESIGN AND METHODS - Prepregnancy care was promoted among patients and health professionals and delivered across 10 regional maternity units. 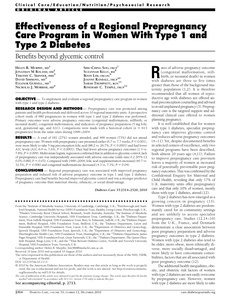 A prospective cohort study of 680 pregnancies in women with type 1 and type 2 diabetes was performed. Primary outcomes were adverse pregnancy outcome (congenital malformation, stillbirth, or neonatal death), congenital malformation, and indicators of pregnancy preparation (5 mg folic acid, gestational age, and A1C). Comparisons were made with a historical cohort (n = 613 pregnancies) from the same units during 1999-2004. RESULTS - A total of 181 (27%) women attended, and 499 women (73%) did not attend prepregnancy care. Women with prepregnancy care presented earlier (6.7 vs. 7.7 weeks; P < 0.001), were more likely to take 5 mg preconception folic acid (88.2 vs. 26.7%; P < 0.0001) and had lower A1C levels (A1C 6.9 vs. 7.6%; P < 0.0001). They had fewer adverse pregnancy outcomes (1.3 vs. 7.8%; P = 0.009). Multivariate logistic regression confirmed that in addition to glycemic control, lack of prepregnancy care was independently associated with adverse outcome (odds ratio 0.2 [95% CI 0.05-0.89]; P = 0.03). Compared with 1999-2004, folic acid supplementation increased (40.7 vs. 32.5%; P = 0.006) and congenital malformations decreased (4.3 vs. 7.3%; P = 0.04). CONCLUSIONS - Regional prepregnancy care was associated with improved pregnancy preparation and reduced risk of adverse pregnancy outcome in type 1 and type 2 diabetes. Prepregnancy care had benefits beyond improved glycemic control and was a stronger predictor of pregnancy outcome than maternal obesity, ethnicity, or social disadvantage. © 2010 by the American Diabetes Association.